As a leading business process services company Solix is committed to the development and deployment of innovation that helps governmental and commercial organizations efficiently acquire customers and more deeply engage them in complex programs. Solix Intuition is the powerful Solix business intelligence and analysis tool that helps organizations better understand market conditions and performance information while providing critical strategic insights to drive program planning and resource deployment. Powered by QLIK, the next generation data analysis and graphical visualization system, Solix Intuition empowers program managers with improved program visibility and powerful marketplace insights. Qlik is a registered trademark of QlikTech International. Large-scale, complex public and private programs rely on precise analysis of a range of detailed program related data and analytics. Having accurate business intelligence at your fingertips is key to large-scale eligibility determination and back-end program performance. Solix uses Intuition as just one of many ways they provide business management consulting to clients across multiple industry verticals. Solix Intuition provides Solix clients with 360° perspectives on a range of critical GIS-based data and performance metrics to help inform intelligent and informed improvements in program management and resource allocation. Solix Intuition permits Solix clients to access, combine, and strategically analyze multiple information feeds and data sources to illustrate potential program growth opportunities or to assist in compliance management by illuminating areas of possible waste, fraud, and abuse. Solix Intuition helps contextualize large amounts of data often associated with complex programs to help easily identify trends and issues so they can make informed program improvement decisions. Solix Intuition makes critical large scale program information and analysis available through virtually any web enabled device. From PC to tablet and smart phone, Solix Intuition provides fast, easy access to KPI data and program metrics management needs to drive today’s increasingly complex programs. To better understand marketplace conditions and program improvement opportunities it is often necessary to utilize multiple data sources. Solix Intuition enables Solix clients combine internal and external data and perform diagnostic analysis that reveals key areas of program improvement and/or expansion potential. Importantly, Solix Intuition provides users with self-service analysis and contextualized information that produces actionable outputs in easy-to-understand and utilize information. Data analysis can be viewed through customized management friendly dashboards that visualize key data and areas of program improvement opportunity. From deep dive market analysis to complex geo-data lookup, Solix Intuition provides insight into patterns not easily interpreted through tables or charts. Our Solix Intuition tool enables users to mix and match multiple data sets to drive mission critical insights that can be visualized on multiple dimensions. The platform enables a full spectrum of data and GIS mapping that can be applied to a broad range of use cases and client specific program management challenges. For example consumer populations can be identified by income and graphed into segments or plotted geographically using household income information from publicly available government databases. Data and analysis can be self-driven with Solix Intuition and restricted to permission only users, and include on-demand analysis of critical performance metrics. 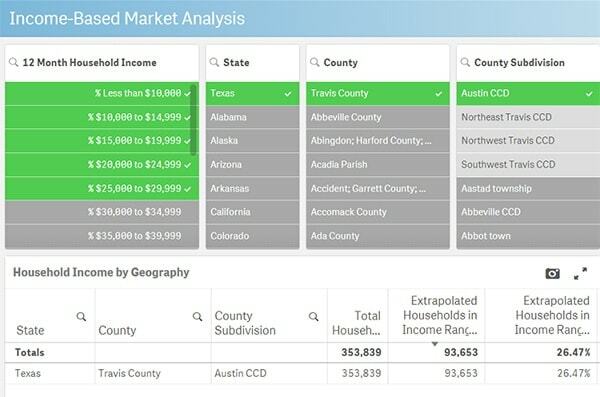 Let Solix show you how to improve the transparency of available market and population specific data to your organization’s advantage. Solix Intuition supports our commitment to help improve people’s lives by connecting them to the vital programs they need the most! See what improved marketplace visibility can mean to your large scale program management and efficiency objectives.